If you have been playing around with SharePoint Communication sites, you might have noticed there is commenting functionality available now on site pages. Digging deeper on how this functionality is implemented gives us some interesting findings! There is a Comments REST API available which is used to get and post comments for a particular page. This endpoint is an addition to the SharePoint REST API, which means you will already be familiar with using it. I checked with Vesa Juvonen from Microsoft and he has confirmed this is indeed a public API, which means it can be used in third party solutions and is not something internal used only by Microsoft. Comments are not stored in the page list item (which makes sense in terms of scalability). They appear to be stored in a separate data store. Comments are stored with references to list guids and item ids. This means that if you move or copy a page, comments for that page will be lost. Only a single level of replies is allowed. Which in my opinion is a good thing as this will prevent long winding conversations and force users to keep their comments brief. This will bring back all the top level comments for a page which has the id 1 and lives in a site pages library with guid "1aaec881-7f5b-4f82-b1f7-9e02cc116098". Where 2 is the id of the comment. Since each comment or reply gets a unique id, the method is same for deleting both. You can disable the comments on a page when you edit the page. I have tried running your SPFx webpart which comes back and says 404 object not found. I am trying to find the comments list for a Site-Page from a Communications Site. The guid for the Site Pages library on your site will be different. Alternatively, you can also use the title to get the Site Pages library. Thanks for the reply, I think you mean for the Comments Library not the site pages library. Can I use a partial match in REST CALLs. eg can I look for lists that start with "Comments" ? If not how can I find the title of the Hidden Comments list ? There is no library in the site where the Comments are stored. As mentioned in the post, they are stored in a separate data store which can only be accessed with the REST API. The way to access the comments with the REST api is to do a /Comments after the path to the page. Thanks for this. What I was hoping was that I could attach an event to the comments list (which of course now does not exist) so that I could set up some sort of moderation when a comment is posted. Is there no way I could detect when a comment is posted then ? Why don't we have any feature to edit the comments, as we used to have in SharePoint blog sites ? Also is there any way to create alerts to the comments? 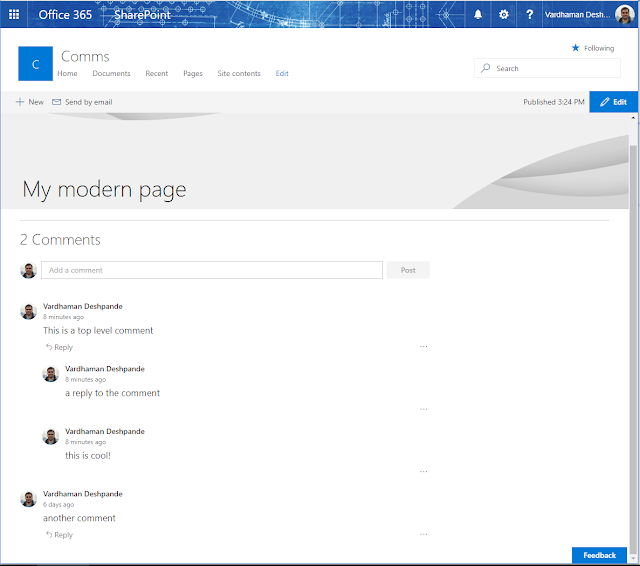 Is there a way to moderate comments in SharePoint Online? We are currently in an on-prem version of SharePoint (wanting to move to SPO) and our current tenant allows us to moderate comments before they are posted.